A recent exercise undertaken by Shelter Cymru’s Take Notice project shows why it is important that service providers make a continual effort to listen to the views of real people. Is there a better way to find out what’s being done well in homelessness services and what needs to be improved, than by asking the people who actually use those services? Over a three week period in August and September, Take Notice project members visited four different housing service providers in Swansea, posing as mystery shoppers using scenarios based on their own personal experiences of homelessness. 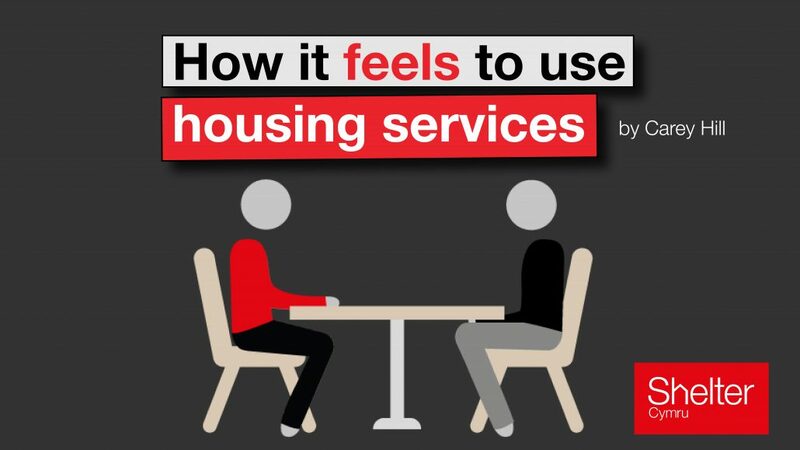 They carefully documented their feelings about these visits, providing a unique insight into the feelings of people using our services; one that has been captured through the eyes of people with direct personal experience of housing crisis. Take Notice members were asked to look at the initial welcome that a person receives when visiting a housing provider, and how accessible the premises and therefore the service is for people. Psychologically informed environments and trauma informed approaches continue to be emerging agendas in homelessness services. The physical environment and first impressions of a service are important as they will set the tone for the ongoing relationship between service user and provider. Evidence-based design stresses the impact of the environment on our well-being and behaviour. We wanted to see to what extent things such as comfort, colour, light and space had been considered in the organisations we visited. We also wanted to find out the extent to which mystery shoppers felt treated with respect and whether staff were interested in their individual circumstances. Ideally we hoped to find that Swansea housing and homelessness providers were putting the person at the centre of their service and treating each person who approached them compassionately. In total 21 mystery visits were made which allowed some consistent themes to emerge from the exercise. Take Notice members felt that the services were easy to find and that waiting times were minimal. They generally felt that the services were brightly decorated and welcoming and where this wasn’t the case, they didn’t hesitate to point out the difference that this would have made in terms of feeling relaxed and welcome as they walked through the door. More importantly, the majority of visitors felt that their enquiries were handled sensitively and respectfully almost all of the time. They felt listened to; they felt they were given time to explain their situations; and they felt they knew what would happen next. Take Notice members told us that they wanted to see significantly better disability access and language accessibility. There were issues with privacy with people having to disclose personal and sensitive information in earshot of anyone else in the waiting area. Where private rooms were available, these weren’t always offered or clearly signposted. They felt that where they encountered increased security measures that these were off-putting: services without glass barriers or security guards felt more inviting. They were disappointed that signposting to other local services that could provide a range of help and assistance was not more consistent. We were able to feedback that housing officers and reception staff, as well as handling issues sensitively, should take get better at signposting to other local agencies as this goes a long way to people feeling like their circumstances have been listened to and taken seriously. Twenty-one visits and four reports later, the participating organisations have a unique insight into what they are doing well and what needs to be done to better meet the needs and expectations of the people who come to them for help. Find out more about Shelter Cymru’s Take Notice project.